The killing of an IAF officer by a rich kid rashly driving an Audi in Kolkata has once again brought into focus the influence of the high and mighty who are being protected by police. A brand new Audi Q7—only nine days old—tears down an arterial road in Kolkata at 6 am on January 13, breaking several road barriers put up by the Army to create a “no civilian zone” as they are rehearsing for the annual Republic Day parade. The SUV reaches the main gate of the Eastern Command Headquarters, does a U-turn and rushes towards a marching contingent of the air force. It hits the drill instructor who is flung 20 feet into the air and killed instantaneously. The Audi continues to move at high speed, bulldozes through another set of barriers and comes to a halt a few hundred yards away. The driver gets out, locks the car, rips off the temporary, paper number plates and walks away without anyone seeing who he is or where he went. In a city where rash driving, flouting of rules and road rage are common, the accident would have been another statistic of a pedestrian fatality caused by a reckless driver had it not been for the protagonists involved and the dramatic manner in which it took place. Coming so soon after the Pathankot fiasco, the incident also raised questions about the security forces’ preparedness to combat a similar attack. What if the vehicle was laden with explosives and driven by a suicide bomber and not a drunken youth? The victim of the hit-and-run, 21-year-old Corporal Abhimanyu Gaud of the Indian Air Force, was taken to the nearby Command Hospital where he was declared dead. Gaud, originally from Gorakhpur in Uttar Pradesh, had grown up in Surat in Gujarat where his father had gone in search of a livelihood and started a furniture business. Col Richard Fernandes, the commanding officer of the 12 Garhwal Rifles, was standing just 5-10 meters from the air force contingent when the speeding Audi hit Gaud. He helplessly watched Gaud fly into the air on impact and land flat on his chest. Fernandes is the main complainant in the case and an eyewitness. From the beginning, both he and other army personnel who saw the accident are adamant that there was only one person in the car—the driver. So who was the driver? Richie rich: The prime suspect Sambia Sohrab’s mobile records show that he spent most of the night prior to the incident at various nightclubs in the city. The Audi was so new that the invoice was still in the car when the driver parked it and fled. The car is registered in the name of Mussadi Business Pvt Ltd. Ambia Sohrab is the additional director of the company and his younger brother, Tousiff Sohrab, its director. And here lies the catch— both are sons of Mohammad Sohrab, a former MLA elected on a Rashtriya Janata Dal ticket and now close to the Trinamool Congress. Mohammed Sohrab inherited his father’s green coconut business and expanded it to eventually become one of Kolkata’s biggest fruit merchants. Retired police officers claim he also benefitted from the booty left behind by satta don Rashid Khan after his arrest in 1993 for the Bowbazar bomb blast which killed 69 people. According to sources, the Kolkata police team had closed in on the Sohrab house within three hours of the incident. 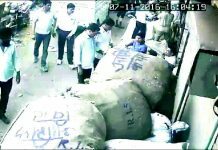 A team of 12 policemen led by two inspectors camped at Jorasanko police station close to the Sohrab home, but the mission was called off after instructions from Lalbazar, Kolkata’s police headquarters. Sources claim that both Mohammed Sohrab and his elder son, Ambia, were at home then and could have been picked up. Minutes after the police left, CCTV footage captured Ambia walking out of the house. Both he and his father are still missing though police have issued lookout notices for them. 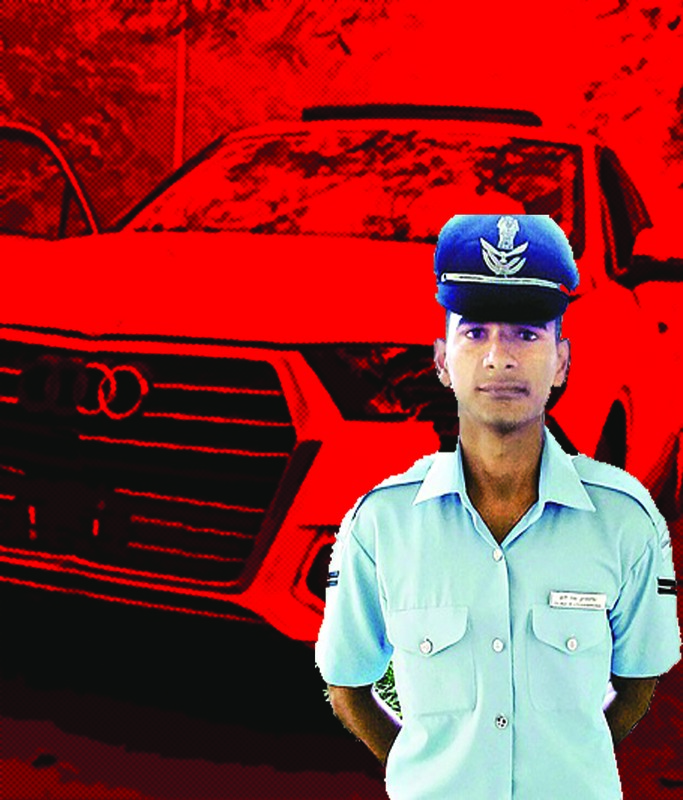 Ambia, 26, had taken delivery of the Audi Q7 from the showroom nine days earlier and according to a retired IPS officer, it is essential that he be questioned. “It is mandatory to examine the owner of a car involved in a lethal hit-and-run especially in a high-security zone. There are times when the owner will claim that the car has been stolen. There could also be a possibility that someone else was driving. Whatever be the case, the owner needs to clarify how his vehicle reached the place of occurrence and who was driving it,” said the officer. Ambia works in his father’s business and cars are his passion. He owns a fleet of them, including a Hummer, a Lamborghini and a Porsche and the Audi Q7 was just his latest acquisition. Apprehending the fate of the probe, the IAF had requested the police for a joint investigation, particularly as the police’s version has been differing from theirs. But the police has turned down their request. However, four days after the incident, it was Sohrab’s younger son Tousiff alias Sambia who was picked up by the police as the prime suspect. Sambia, unlike his elder brother who dropped out of school after Class VIII, did his schooling in Darjeeling and then got a MBA from an institute in Bangalore. The 24-year-old also joined his father’s fruit business and was responsible for expanding it to China. He shared his brother’s love of fast cars but according to acquaintances, was a rash driver with multiple instances of near misses. The Powerplay: Sambia is the younger son of Mohammed Sohrab, a former RJD MLA now close to the Trinamool Congress. Sambia got married just a few days prior to the incident, when his father threw a lavish reception in Kolkata attended by several TMC ministers and IPS officers. Known as a party animal, Sambia’s mobile records show that he spent most of the night prior to the incident at various nightclubs in the city before mowing down Gaud in the morning. The police arrested two of Sambia’s friends too — Shahnawaz Khan, alias Shanu and Noor Alam alias Johnny — as accomplices who are said to have been with him on the night of the incident. Shahnawaz, grandson of satta don Rashid Khan and a part-time model, claimed that Sambia was alone in the Audi and driving it. He added that Noor Alam and he were in a Skoda sedan following the Audi when the police stopped their car before the “no civilian zone” and told them to take a different route. They were nowhere near the scene of the crime, they claimed. The police suspect that Sambia escaped after the hit-and-run in the Skoda. However, Sambia has claimed that he left the Audi, walked about 400m, hailed a taxi and went to his in-laws home in central Kolkata. 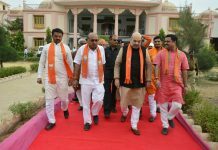 Frightened of what had happened, the three accused fled the city together hours after the incident and went to Ranchi. The next evening Shahnawaz left for Delhi from where he was picked up a few days later, while Sambia and Noor Alam came back to Kolkata. Apprehending the fate of the probe, the IAF had requested the police for a joint investigation, particularly as the police’s version has been differing from theirs from the beginning. While the army witnesses have been adamant that there was only one person in the car, the police say there were several occupants which may dilute the case against Sambia. However, Lalbazar has turned down their request. “Starting from the air force chief, we are monitoring the probe very closely. We have realized that unless we keep up the pressure, the administration will not do what they are supposed to do. We are aware that there is an attempt to twist the case to suit a few people but we will keep up the pressure to prevent any such thing and get the soldier justice,” a senior air force officer said. Children of wealthy and powerful parents are used to considering themselves above the law and in this instance too, had it not been for the fact that IAF is determined to get justice for the victim who was one of their own, the culprit would have bought his way out of a serious misdemeanor.